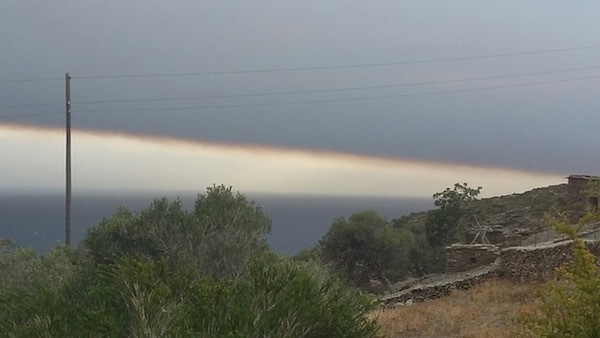 By evening, the clear sky over Andros was grey-brown with smoke from the fires at Mati. ANDROS Greece—(Weekly Hubris)—October 2018—“With the first drop of rain the summer was killed.” (Με την πρώτη σταγόνα της βροχής σκοτώθηκε το καλοκαίρι.) This first line of Odysseas Elytis’s poem “Eleni” sums up the essence of summer in Greece. Rain is simply not part of it. We are used to a final thunderstorm in early June and perhaps another around the 15th of August, which is the one that heralds the coming of autumn even though it’s inevitably a false alarm. But what happens when it rains all summer long? Not every day as in Connecticut this year or England most years, but almost every other week, and for days at a time: at the beginning and end of June, at the end of July, and several times in August and in September, too. And not just gentle showers that nourish the plants but torrents that flooded the streets, turned parking lots into marinas, and caused geysers to gush from blocked drains. Yet while phenomena like these were breaking news in Athens and on the mainland, and even on Andros to the east of us, our own corner of the island seemed to possess an umbrella. When it poured elsewhere, we would receive only enough drops to splatter the plaques on our terrace and, just once, enough to rinse the dust off our cars. A mere mile away, puddles filled the potholes and friends’ gardens got a good soak. We got the scudding clouds, “sound and light shows” that sometimes lasted hours, and relentless winds that sandblasted us when we ventured to the beach. My rain dances were futile, but my songs to the underground water, improvised ditties in Greek and English, kept our borehole flowing, or so I like to pretend. The summer’s unseasonal storms, which did more harm than good, followed a rainless winter and spring. Even as early as mid-June, not long after we arrived to stay, locals were telling dire tales of trickling springs, water rationing in the main towns, and rivers reduced to dry beds. Most alarmingly, the river at Paliopoli, born of waterfalls tumbling down the mountain, had ceased completely. Farmers were biting their nails. Would they have enough water for their crops? A friend’s borehole gave out before July. And all this on an island whose ancient name was Hydroussa, the watery isle, the only one in the Cyclades archipelago blessed with streams and rivers and even a source plentiful and pure enough to bottle (under the name Sariza). The warm winter and drought has meant not a single olive on most of the island’s trees, while the Peloponnese is reporting the second worst grape harvest in this century thanks to the inappropriate timing of deluges. The late-July Mati fire took 99 lives. There was also too much wind, fierce northerlies when they were not expected—they are common and even welcome in August to drive the heat away—but also one sudden squall from the west that ended in tragedy. That Monday, the 23rd of July, we were uneasy. Early in the afternoon, a friend closer to the port of Andros wrote in a text message that she smelled smoke. By 5:30-6, clouds the color of bruises sailed over us from Attica. 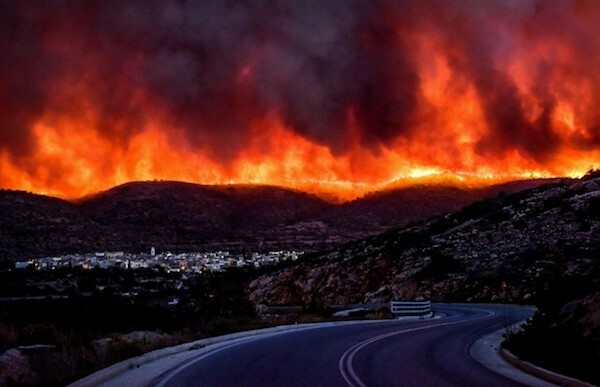 My son in Athens reported two fires, one threatening the refineries towards the Corinth Canal, the other on Mount Pendeli, which was to race faster than a Marathon runner towards that famous road and wipe out hundreds of homes on the coast before it extinguished itself in the Aegean. The death toll stands at 99 people so far, with untold numbers of wildlife and household pets as collateral damage. Somehow, perhaps because it was so close to Athens and Rafina, the port we use to come to Andros; because everyone knew someone who had escaped with their lives but lost their property; because of the sheer scale of the disaster and the inadequate, even criminal mistakes made in coping with it, we felt stricken. I and other friends found ourselves bursting into tears without warning, unable to sleep, watching miraculous rescues on TV, sharing sagas of daring drives out of the inferno, narrow escapes, or heart-warming scenes like that of a woman sharing a rock in the sea with a dog for hours until help came (and reunited both woman and dog with their families). But there were too many horror stories: the fireman who lost his wife and newborn child; the 25 people clustered on a cliff-edge property who died in each other’s arms unable to find the narrow path down to the sea because the smoke was so thick. 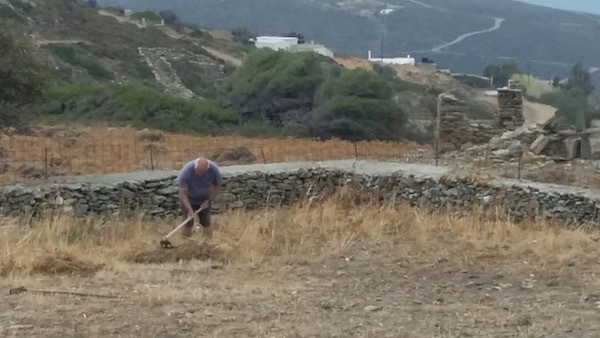 One acquaintance wrote a letter first to her friends and then to “Kathimerini” newspaper about her failed attempt to get the mayor of Rafina to provide dumpsters where residents could dispose of garden waste. She herself had cut down three towering pine trees the year before and planted olives in their place, despite being told that cutting a pine was against the law and she’d be fined heavily if caught. Thanks to her foresight, her beautiful house was saved, but part of the garden caught fire along with the piled branches and cuttings that her neighbors had hurled over the cliff, having nowhere else to take them. A day or two later, torrential rains poured on Attica for three days, turning ash to sludge. My man with his hoe in part of our thistle kingdom. Here on the island, we swam through our tears—our salt mingling with the sea’s—and gradually recovered, picked our figs with gratitude every morning, and discovered a new pastime: feeding the neighbor’s sheep and goats. This year, failing to find the guy who usually clears our acre and a bit of thistles, wild oats and wheat, giant fennel, and other weeds, my husband decided to do it himself, not with a strimmer but a hoe and a rake. By early September, he had finished, but earlier on we had decided how to deal with his little mounds of cuttings. Instead of adding them to the big “hill” of accumulated stuff from the past three years, we would toss them over the fence. 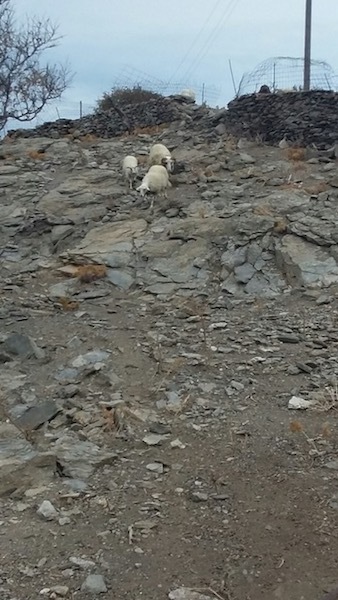 The sheep soon learned of the extra munchies in their domain. And now, every evening at 7, they come baa-ing and practically stampeding down the hill to receive delicacies such as hand-cut, sun-dried thistles. No matter that thistles are all that’s left standing on the plots where they graze. Ours must be a bit softer. I pitchfork the weeds over the wall, often onto their heads and backs, while they, oblivious, chomp on. Sadly, we’re finished now, but they still come at the appointed minute and baa reproachfully. The first of the flock of about 20 sheep coming for their snack. You can see why they are so eager. September had two other highlights: One, the only non-endangered species in our waters, the sea urchin, was plumper and tastier later into the season than ever; and Two, the appalling roads down to our delicious beaches were graded. Midway down both bad roads, the graders had sat idle through much of August, but suddenly sprang to life in the first week of September, after most of the tourists and summer people had departed. And lo and behold, we now have almost smooth surfaces, which will hold until the next big rain, for the job has been very sloppily done. But we are grateful for small blessings. As summers go, it was not the best but certainly not the worst. Having no WiFi, avoiding the TV most evenings, and rarely buying a newspaper, we protect ourselves from Trump’s tweets, Syriza’s lies, Putin’s poisons, and the Sultan’s threats. But we cannot prevent ourselves from worrying about Mother Nature’s warnings: the fires in Sweden and California, the heat waves in Northern Europe (which was hotter than Greece), the hurricanes, and here the empty seas, the absence of insects (even mosquitoes!) except for the tiny ants that have invaded our kitchen, and the demise of several beloved fruit trees. This glimpse of the future holds no promise of carefree summers, or winters, for that matter. Will we wake up in time? Carefree beach reader, soaking up soothing sun and sea. This wonderful, simple recipe fell out of a cookbook while I was trying to think of something original for a small lunch party. I hadn’t seen it for years, but remembered my old friend Maggie Logothetis’ cooking and this delicacy in particular as vividly as if I’d eaten them yesterday. I reproduce it here as she typed it. “Difficult to give quantities really: But here is an approximate idea. To 1 of fish you put ½ quantity of potato Boil up white fish (bream, grouper), either in already existing fish stock or in water with bay leaves, onions, and peppercorns added. When cooked, skin, bone, and flake the fish. Boil up the potatoes in the fish stock and mash well. Saute chopped onion in oil until well cooked but not brown. The quantity of onion depends on how much you like onion. I put rather a lot of onion. Mix fish, onion, and potato well together and, at this stage, you may add an egg yolk/s (all depending on the quantity you are making) and season very well. Take a little of this mixture, roll into a ball, flatten out, dust with flour and fry in very little oil in a non-stick pan if possible. What I (DFL, not Maggie) did this time was to boil slices of frozen cod in a court bouillon of water, wine, bay leaf, onion studded with three cloves, and black peppercorns. I longed for one of those concentrated/jellied essences of “homemade” fish stock Knorr produces but our supermarket here is not that sophisticated. I boiled the fish and squeezed out all the liquid with my hands, sautéed lots of chopped onions, boiled the potatoes in the broth, left out the milk, mashed them, bunged everything together, mixed in two whole eggs (beaten), and seasoned the mixture with lots of parsley, pepper, very little salt, and a bit of smoked paprika that was sitting on the kitchen table. I also let the mixture rest in the fridge for several hours before I formed the patties. Everybody thought they were scrumptious, and the few left over were good the next day too. fish cakes for supper tonight! As poignant a description of what lies ahead for our world as any I have read. . . this is a lovely, sad, and loving reflection. Thanks, dear Diana, and admiration to your dear Harilaos for his labors. I just read this today, Diana, and how horrifying and heartbreaking, not just the fires but the gradual loss of the beautiful round of the seasons and all the creatures who depend on that. I fear this will become a regular tale for us all. Thank you, dearest fellow Hubrisians, for your lovely comments. I cherish you and your writing. Loved talking with you today and rushed immediately to the Weeky Hubris. 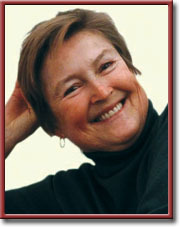 You write so compellingly and so beautifully that even the recounting of a tragedy has an unforgettable aura about it. How terrible and horrifying the fires must have been. Our climate is now so unpredictable that it is hard to prepare for whatever may happen.